In the age of apps, we have seen basic human activities like eating, dating, shopping, and exercising be condensed into simple swipes and clicks. It’s a brave new world and one that has folded-in the complex process of financing, developing, and designing new projects. And in recent years, there has been a batch of new apps designed to help planners, architects, cities, and the general public create more livable cities. Here are a few of those apps that caught AN’s attention. Imagine if you could redesign a city street in an instant—without the hassles of political approval, community input, or extensive planning. Sounds pretty nice, right? Well, an app called Streetmix lets you live that urbanist dream, at least in a two-dimensional, cartoony kind of way. 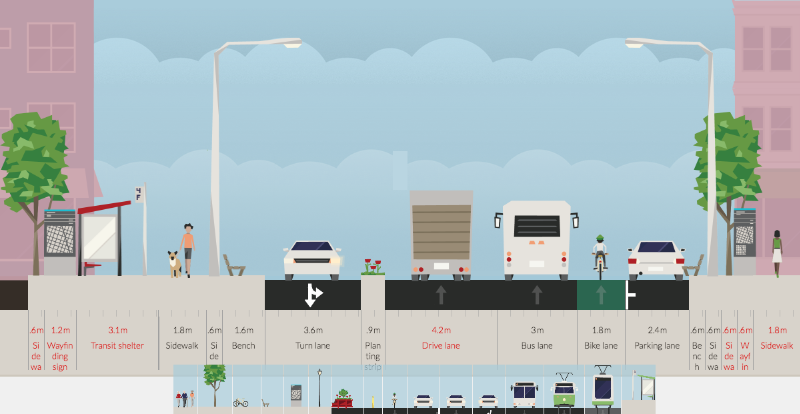 In the Streetmix world, if you want a wider bike lane, you can go right ahead and build a wider bike lane. You want light-rail? All aboard. You want a wayfinding sign? Done. How about two wayfinding signs? They’re already in. It’s just that easy. Now, obviously, the app is not intended to be an actual data-driven planning tool. For starters, there are no implications if you, say, remove all driving lanes and mass transit options and replace them with trees and benches. And that’s the fun of it. Instead, Streetmix was designed as a user-friendly program that lets everyday citizens understand what’s possible on a typical city street. Lou Huang, of Code For America, which is behind the app, told Next City that he hopes these people can then use this knowledge to better engage in their community’s planning process. A neighborhood’s lively mix of restaurants, bars, streets, and shops can be both its biggest draw and its most frustrating feature. All of that street-level action may signify a vibrant and livable slice of the city, but try living directly above it. Try getting some sleep with all of that constant chaos. 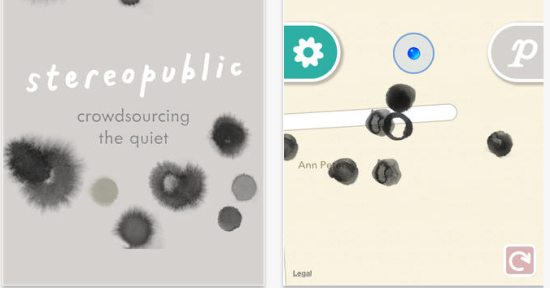 For those who have to wear earplugs, and sleep alongside a white noise machine, there are two apps that may be able to help you out. The first is called WideNoise and it allows users to track noise pollution across an entire city. It’s part of a larger, open-source EU project called EveryAware which monitors all types of pollution. WideNoise is focused entirely on the noise side of things. “With WideNoise you can monitor the noise levels around you, everywhere you go,” explained the app’s creators on its website. 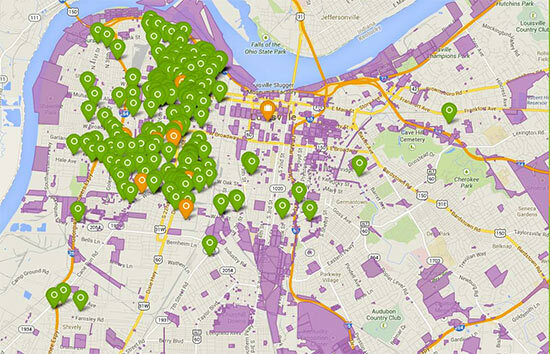 “You can also check the online map to see the average sound level of the area around you. Do you live in a ‘sleeping cat area’ or in a noisier ‘rock concert area’?” So WideNoise might not be a huge help to those currently living in a noisy area, but it could be a helpful tool when they try to escape it. 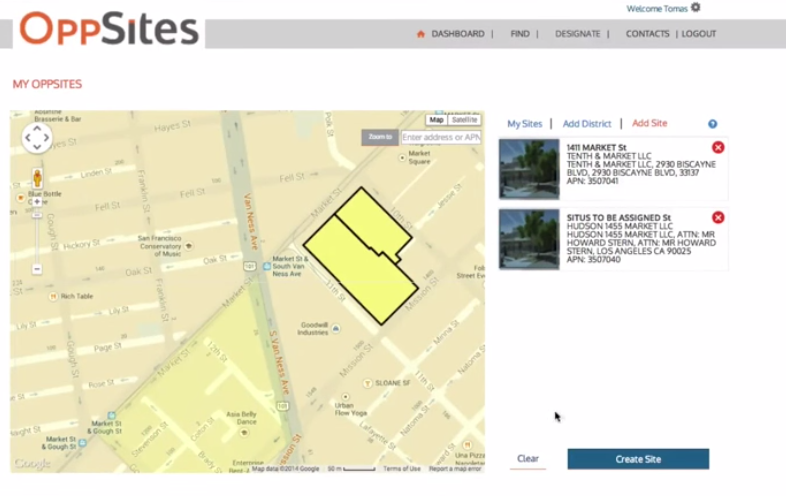 Officially launching this fall is OppSites, an app that connects cities that want to develop with national investors who can make it happen. To do that, the platform allows cities to “promote their development priorities and share local knowledge” with interested investors. There is a free service that offers investors real-time market and civic updates on certain sites, but those willing to shell out a few dollars can get the premium level that provides visualizations of development opportunities. There is also a similar website with a similar name, OpportunitySpace, that offers a similar service: portals that visualize under-used or vacant sites that are all publicly-owned. The idea is roughly the same—connect developers, investors, and the public with information about cities, but the website is focused entirely on government properties that have seen better days. 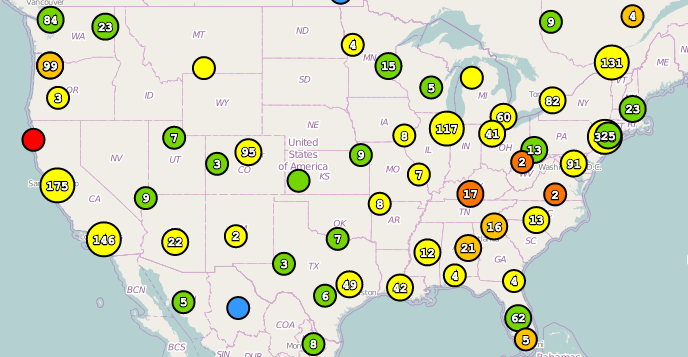 In June, the site’s cofounder and CEO, Alex Kapur, told CityLab that all the information they display is publicly available, it’s just not publicly accessible.